Unlike in Midtown Manhattan, trash is a rare sight in Barcelona’s El Raval. Many streets in this Spanish neighborhood are barely wide enough for two scooters to pass each other. A truck coming through to collect New York-style piles of black bags would be near impossible. Instead, many areas of the city use a system which has been around for decades but sounds like something out of the future—vacuum collection. All residents have to do is go to the nearest pneumatic tube terminal outside their buildings, open a little door, and drop their waste in for it to be whooshed away. From there it travels underground to be turned into heat for homes, recycled, or otherwise disposed. While major European cities are using similar technology to handle their garbage as locally as possible, New York is behind the curve. Since the city’s last landfill closed in 2001, trash now travels hundreds of miles away—as far as Pennsylvania and South Carolina—at an increasingly high cost. New York Mayor Bill de Blasio has proposed an ambitious plan to send “zero waste” to landfills by 2030, but some experts doubt that this growing city of more than 8.4 million people can solve its trash dilemma without rethinking the system entirely. 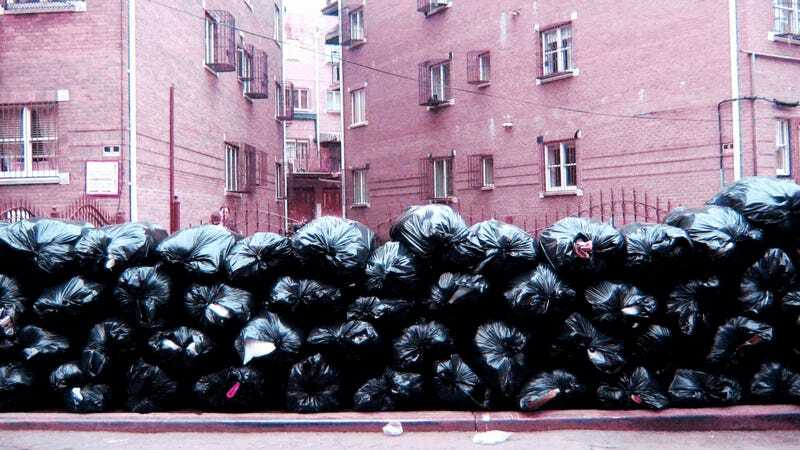 The success of New York’s zero waste plans will have big implications for how other urban areas handle their trash in coming years. Many people are watching to see if a city limited by a lack of available land and known for wastefulness can actually change its ways. Developing new systems to collect trash more efficiently and process it within city limits would be a good first step. A 2013 photo of the Old Dominion Landfill in Henrico County, Virginia. Miller is working with his partners at the planning firm Closed Loops, with funding from state grants, to bring pneumatic tubes to New York’s High Line. Rather than rotting in landfills, carrot peels and apple cores from nearby restaurants could travel under the feet of unsuspecting tourists through pneumatic tubes hung below the elevated park. A small facility could turn them into compost right there in the neighborhood. Soon enough, the park could be growing trees from trash and rats would no longer have a buffet of garbage to feast on every night. If the Closed Loops prototype is successful, their system could eventually serve the entire High Line and surrounding buildings. Food waste could be processed locally, recyclables could be shipped by barges, and other trash could be put on railcars. Roosevelt Island, in the East River between Manhattan and Queens, and Disney World have been using pneumatic waste collection systems for years, but the technology has only recently begun to catch on in New York construction projects. Hudson Yards—a major new development on the west side of Manhattan—will be installing the tubes, and they could become part of other large construction projects in the future. The technology can take more than 10 years to pay off, but for high-end developments or busy neighborhoods, the absence of trucks and garbage bags can be well worth it. These things can be built like Legos. Plug and play. Miller noted that another benefit is minimizing the distance that waste has to travel before it leaves the city. Ideally there would be a way to process it within city limits and close the loop entirely. Food Waste, Recycling and the "Green Loop"
Cities in Sweden, France, the United Kingdom and elsewhere reflect this model. Trash in certain neighborhoods travels via pneumatic tubes or trucks to local waste stations for processing. On the other hand, very little of New York’s waste is handled within the city. Because of the truck traffic and odors that waste transfer stations can create they often face steep community opposition. Most trash is currently taken to transfer stations in a few semi-industrial neighborhoods where residents have less political clout to stop it—such as northern Brooklyn and the South Bronx. An aerial view toward lower Manhattan of one of PRESENT Architecture's proposed "Green Loop" hybrid composting centers and waterfront public parks. Food waste is a main source of these odors and a large component of what gets sent to landfills. Environmental advocates point to the noxious methane releases from landfills as a contributor to global warming. Even as technology improves, landfills were the source of 18% of the country’s human-related methane emissions in 2013. Separating food waste for compost is becoming a priority nationwide. New York is in the process of rolling out the largest curbside food waste collection program in the country, which should be available to every household by 2018, and has also begun to mandate commercial composting solutions. The technology exists to turn this food waste into energy locally. Anaerobic digestion—a process in which bacteria break down the organic material and biogas is created that can heat homes—has already been tested at Brooklyn’s Newtown Creek Wastewater Treatment Plant. Yet many residents don’t want these facilities in their neighborhoods. Traditionally, waste facilities are these horrible boxes that you put as far away from people as possible. Evan Erlebacher, co-founder of Present Architecture, has an idea to change that. He said it comes down to emphasizing design and community benefits. “Traditionally, waste facilities are these horrible boxes that you put as far away from people as possible,” he said. “Does this have to be a horrible thing?" In 2014, Present Architecture proposed the “Green Loop,” an offshore facility that would receive food waste from trucks or barges, compost it on site and use the material for a 12-acre park on the roof. These facilities could be built throughout the five boroughs and serve as community hubs. Though the idea may not be economically possible at the moment, it received a lot of attention and contributed to the ongoing conversation about incorporating waste into city life. One waste-related building that has been successfully integrated is the Sims Municipal Recycling facility in Sunset Park, Brooklyn. It even has the city’s first wind turbine for generating electricity. Since 2013, Sims has handled the majority of the city’s residential recycling and become a center for education. Recycling is viewed at the Sims Municipal Recycling Facility, an 11-acre recycling center on the Brooklyn waterfront. Approximately 19,000 tons of metal, glass and plastic are collected monthly by the Department of Sanitation in New York City. Recycling has come under fire lately from critics who say that its costs outweigh the environmental benefits. With oil prices low, making new plastic is currently cheaper than recycling old plastic in many cases. A weaker economy in China has also meant less demand for scrap metal. Eadaoin Quinn, Sims’ education coordinator, disagrees that recycling is on the decline and said the more material people can send the better. Sims has a 20-year contract with New York—which protects it from major fluctuations in commodity markets—and is invested in the city’s future. In a hundred years we’re going to be going back to the landfills digging out the metal. Quinn said that Sims is equipped to take much more than they get. New York’s curbside collection program was established by law in 1989, but only 16% of the city’s garbage is currently being diverted for recycling. Quinn estimates that number could double if everyone pitched in. That would put it closer to the national recycling rate, which was 34% in 2013. While New Yorkers are faced with trash on the streets every day, many people think of its disposal as something that just happens, giving little thought to where it all ends up. Yet as the environmental costs of creating new food and products become greater, it’s getting harder to justify digging up raw resources—or burying them in landfills—when people can take a moment to separate them right at home. This is the first of four articles exploring the future of waste in New York. Next: Waste as a resource—what to do with the trash once it's picked up. Cole Rosengren is a garbage enthusiast, Mainer and Brooklynite. He covers local government and environmental issues in New York.